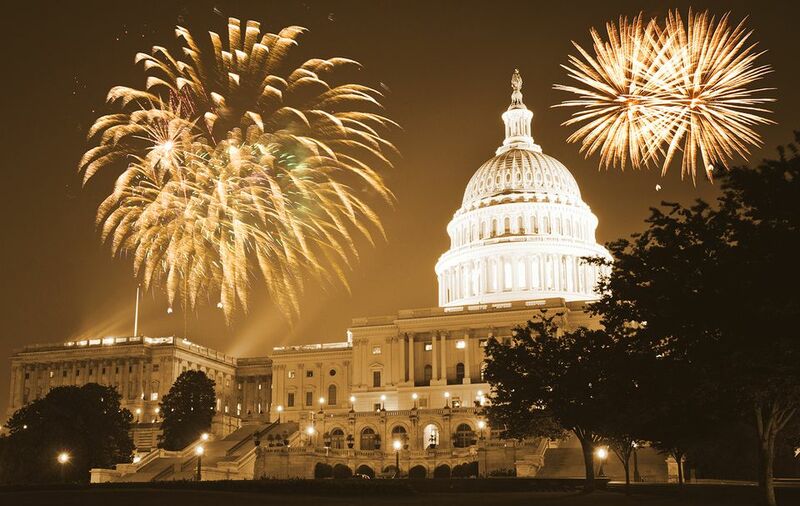 There's plenty to do in Washington, D.C. on New Year's Day. While many businesses are closed on January 1, a surprising number of attractions are open and welcome visitors. There are a lot of great ways to spend your day in the nation's capital from enjoying the Smithsonian Museums to taking a hike in a local park. Many of the New Year's Day things to do and see are free. Yes, the Smithsonian museums are open on New Year's Day. Explore the world-class museums and you'll see a variety of exhibits ranging from art to space exploration. This is a great day to visit the most popular Washington, D.C. museums because many people sleep in after a big night of celebrating. The National Air & Space Museum and National Museum of Natural History are favorites for all ages. New Years Day is a good time to see the monuments and memorials in Washington, D.C. and Northern Virginia. Parking should be easier than other days of the year and the crowds should be thin, especially if you get an early start. Although the most famous monuments and memorials are on the National Mall, you will find statues and plaques on many street corners around the city. You may want to get some exercise and take your own self-guided excursion as most of the guided tours do operate on January 1. The estate of George Washington is open every day of the year. During the holiday season, visitors get a glimpse of an early-American Christmas. Exclusively during this time, the rarely-seen third floor is open to the public. An elaborately re-created dessert course is displayed in the large dining room with the Washingtons' famed "Great Cake" as the centerpiece of the feast. The property is a fun place to walk and explore. The National Zoo is open and makes a great excursion on New Years Day. Washington DC's 163-acre zoological park features more than 400 different species of animals. Dress for the weather and wear comfortable shoes. Stay until dark and get one of the last glimpses of the Zoo Lights displays. The Botanic Garden is open every day of the year, too. Seasons Greenings, a great holiday exhibit, features unique model trains and incredible replicas of Washington, DC's most famous buildings and monuments. Get an early start in the day as this is a local favorite and may even be busy on New Year's Day. More than 250,000 American servicemen, as well as many famous Americans, are buried at the 612-acre national cemetery. Among the notable Americans buried here are Presidents William Howard Taft and John F. Kennedy, Jacqueline Kennedy Onassis, and Robert Kennedy. The cemetery is a peaceful place to walk and contemplate. The museum is open on New Year’s Day from 11:00 a.m. to 5:00 p.m. The Building Zone, open until 4 p.m., is a hands-on introduction to the building arts designed especially for the Museum’s youngest visitors, ages 2–6. Another exhibit, Play, Work, Build, is a space for adults and children where visitors begin to see the connections between play, design, and the work of building professionals like architects and engineers. This exhibition combines a presentation of the Museum’s world-class Architectural Toy Collection, a hands-on block play area, and an original digital interactive that allows visitors to fill an entire wall of the exhibition with virtual blocks—and then knock them down. Movie theaters are open and a selection of good movies usually come out in time for the holiday season. Local cinemas include the DC movie theaters, Maryland movie theaters, and Virginia movie theaters. Going to the movies is an entertaining way to relax and rest up from the hectic holiday season. If the weather is clear, this is a nice day to take a quiet stroll through a park. Please note that some parks may close their entrance gates, so you may want to call ahead to find out about accessibility. DC Parks include the National Mall and Rock Creek Park. Maryland Parks include suburban gathering places, small mountains with trails and historic points of interest. The Virginia Parks include the Mount Vernon Trail, an 18.5-mile trail running along the Potomac River, paralleling the George Washington Memorial Parkway leading to Mount Vernon. Washington's premier performance venue offers performances on New Year's Day each year. Check the official site for this year's schedule of events. Celebrate St. Patrick's Day Parade in Washington, D.C.